en sindsdien cureren en organiseren we concerten, films, workshops en residencies. Dit jaar doen we geen festival in drie steden maar alleen een beurs ‘EVENT’ voor instrumentenbouwers en bespelers in WORM, net als vorig jaar trouwens. Er is een programma van presentaties en optredens; iedere deelnemer doet in principe ook een korte optreden, zeg maar showcase. Dus op welk moment van de dag je ook komt -de beurs duurt van 2 uur in de middag tot 8 uur in de avond- er zijn behalve veel installaties en module- en instrumenten bouwers ook voortdurend optredens aan de gang in de drie Worm zalen. Aansluitend is er in de avond nog de elektrieke modulariteit van de Noodle Bar in de foyer. Musician, improvisor, instrument-builder. His “Prepared Chamber” is a resonant wooden box in which numerous mundane objects are organized and amplified by magnetic pickups and contact microphones. DIY media artist who develops his creations from re-used material, making use of existing techniques and DIY manuals. His works mirrors the social aspects of technological progress. Will present his “Marine Debris Sound Instruments”. aka Kacper Ziemianin. Artist with a classical musical education and an interest in various musical genres. Ziemianin builds his own musical instruments, modifying existing constructions, as well as interactive audio-visual installations. Sound artist who designs and builds site-specific compositions (mostly under the name of Lost & Found Orchestra) for spaces and objects, which turn these locations into temporary sound installations. Noodlebar bossman. Operates under the artist alias Mono – Poly. Also makes modules and effects. Electronic music producer turned installation artist and instrument designer who developes various instruments and sound utilities under the name Soniphorm (a preamp for coils, piezos and condensor mics called the SoundSniffer). The ‘Synchronator’ is an audiovisual project for which this duo has developed their own electronics. Medium-specific experiments between image and sound from the early years of video art. Industrial designer/artist specializing in the design of electronic devices for audiovisual use. The devices are often sold as kits but also pre-assembled. aka Gong Girl. Musical instruments designer, composer and sound artist whose work gravitates towards the exploration of “world” music and sound culture, critically examining the Eurocentric approach towards musical culture traditions. aka Jan Schellink; all-rounder and outsider instrumentalist who launched a whole series of inventions. Famous for his playable wok pan. Electronica musician and producer. Driving force behind the “Ginko Synthese”. All of his products are designed with a focus on the immediacy of live performance, but can be easily integrated into a studio environment. Composer and performer based in Amsterdam whose recent works focuses on sound extension of traditional instruments. Her most recent performing setup is made out of permanent magnets and coils. Karel makes inflatable work, literally. At the Instruments Make Play he will revive an old piece that only been shown once before. It incorporates a treadmill. Video presentation of the Magnoceptia (Dewi de Vree and Patrizia Ruthensteiner) project – a combination of aesthetics, antennas and performance. Live electronics performer, sound engineer and electronics designer. He is currently a research associate at STEIM, handling hardware and software development. Finds and creates a new value and playful function from e-wastes, from an environmental and sociological perspective. Makes musical instruments by combining circuits and broken electronics, aiming to re-create the garbage in A/V ways. This duo’s “Bubble Drum” consists of suspended pipes that hold coloured water, and produces rhythmical sound and movement by releasing bubbles of compressed air. CEO of Error Instruments – great modular instruments, effects and stuff. 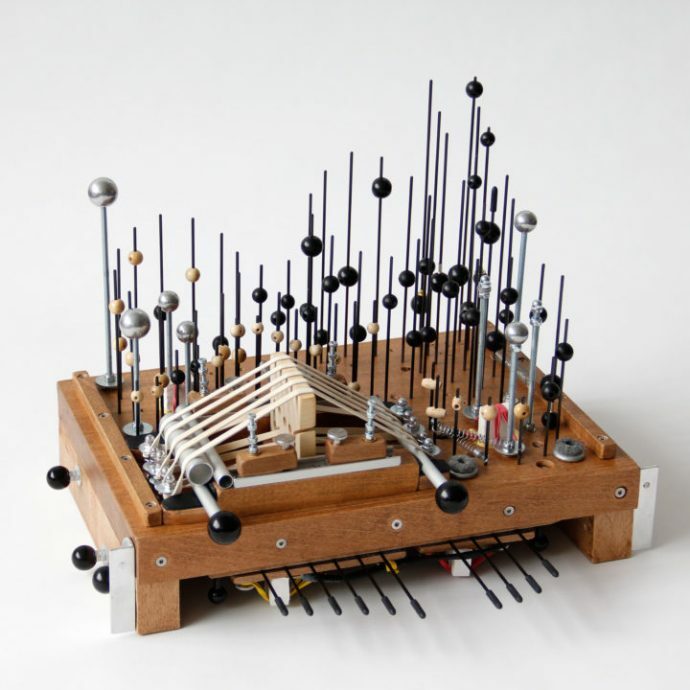 Piers developped the ‘Striso’, a new musical instrument with a distinct and versatile sound, combining the possibilities of electronics with the experience of an acoustic instrument. Installation made for/with strings. A rather megalomaniac affair which includes amplifiers and oscillators. Creative software designer, hardware hacker. Aims to make tools for composition, live performance, interactive installation and sound design for several disciplines. Will bring DIY equipment kits to sell and a selection of his new instruments for demonstrations. Improvisational experiment about the ways that tactile audio can be perceived. Think of tactile feedback and “DADAMachines”. Perhaps NL’s most famous synth & module builder who has always been sympathetic towards the cause of the underground. Now builds a new series of his ‘Blippoo’ boxes. aka Jurgen Winkel: producer, musician, artist & performer. Currently combining electronic music & analog sounds producing experimental and danceable music. Till has been teaching instrument design and sound technology at various international institutions. In his artistic works, he addresses the relationship between seemingly contradictory elements, e.g. the digital and physical realm. Duo performance by Victor Snijtsheuvel and Owen Storni Hoogenboezem. Involves a computerprogram for a lightbox, a musical score, mini guitar and self-built double bass. The performances of We Love Trash can be seen as a dialogue between self-built instruments made from ‘objects trouvés’, and vacuum cleaners, trash and old household electronics. Rotterdam-based collective engaged in all kinds of off-the-wall DIY activities. Current focus: printing and self-made musical instruments. Underbelly is a mobile and on-line shop run by Mariëtte Groot selling books, magazines, records, gadgets, films, tapes etc. focusing on experiment and avant-garde. Mariëtte will be present with a sharp selection of material about DIY, instrument builders, sound art, electronic music, etc.